Amazon Web Services (AWS) offers several media services that make it fast and easy to prepare, process, and deliver broadcast and over-the-top video from the AWS Cloud. These pay-as-you-go services replace costly, hardware-based video infrastructure to deliver great viewing experiences on multiple screens. 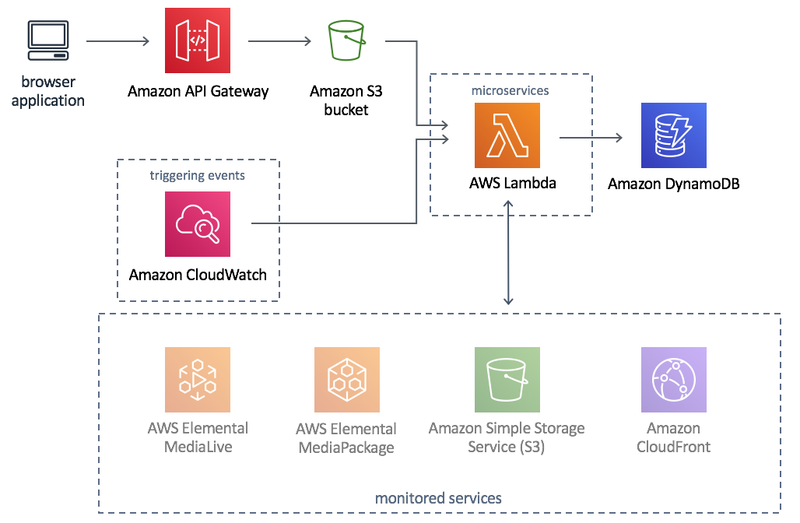 It can be a challenge to understand the workflow relationships between different media services and identify the root cause of a problem when multiple media services are sending messages to Amazon CloudWatch, a monitoring and management service. This webpage introduces an AWS solution that automatically provisions the services necessary to visualize media services, their relationships, and the real-time status of linear video services. The following sections assume basic knowledge of architecting on the AWS Cloud and media service workflows. AWS offers a solution that displays the logical connections between media services, visualizes error messages and counts, and produces a list of confidence-ranked root causes for problematic workflows. The diagram below presents the architecture you can deploy in minutes using the solution's implementation guide and accompanying AWS CloudFormation template. An AWS CloudFormation template configures the solution's core AWS services, which includes a suite of AWS Lambda microservices (functions) that manage the inventory, connections, alarms, and events of your media services. Amazon API Gateway hosts the solution’s RESTful APIs. Amazon CloudWatch invokes the solution's microservices which monitor your media service resources and stores information about them in Amazon DynamoDB tables. The solution also deploys a browser application that visualizes the relationships between your media services, and the status of your resources and pipelines as a workflow diagram using the information in DynamoDB. Currently, the solution monitors AWS Elemental MediaLive, AWS Elemental MediaPackage, Amazon Simple Storage Service, and Amazon CloudFront. Visualize the relationships between your media services and the status of your resources and pipelines as workflow diagrams. You can also customize the solution to include custom node types or on-premise equipment. Aggregate resources into a single channel tile that represents a single streaming video channel. Each tile displays the aggregated media service configuration information for all resources included in the file.